So, did you enjoy reading Supriya's feature post on Bharatnatyam and touring Sridevi's home? I definitely did! Today, we will turn our attention from the grace and grandeur of Bharatanatyam and an artist's passion to a global design trend with a spotlight feature on IKAT plus pictures from my home. 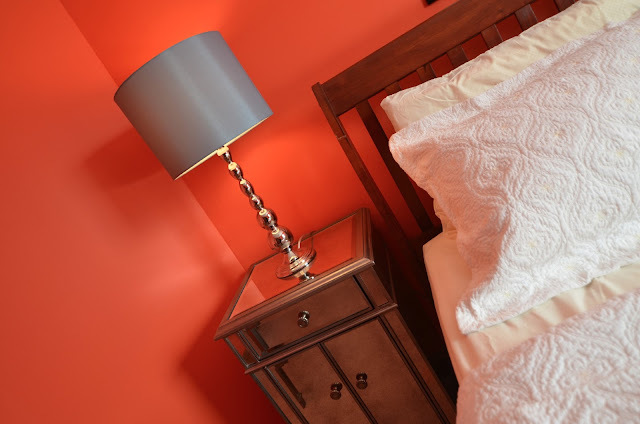 I have been working on our guest bedroom and I am excited to share a few pictures with all of you. If you a read a previous post on my design philosophy then you already know that my home is a potpourri of global design elements. The overall look for my home was not intentionally conceived and in fact it evolves as we go. I spend many weekend afternoons rearranging my favorite decor elements. 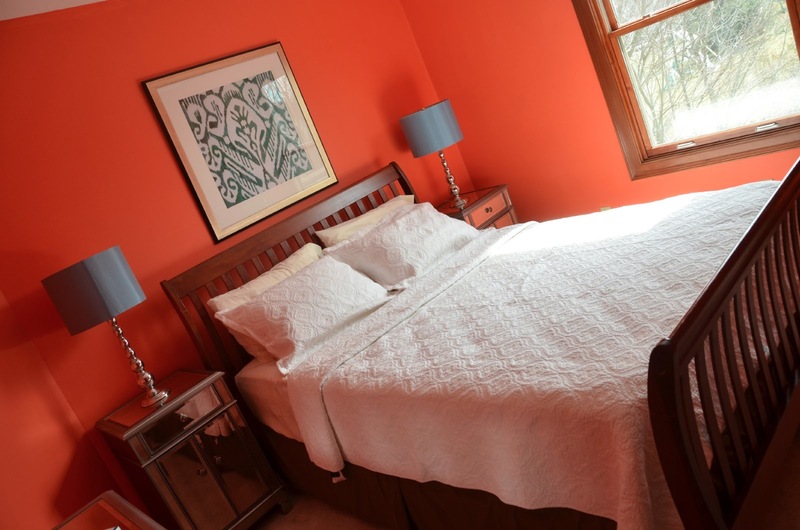 My home features our travel knick knacks, global fabrics, motifs I love and lots of color! The end goal is to create a stylish space which reflects our persona. I wanted to get our guest bed room ready for the summer months and have been chipping away slowly. Our current house has big windows framed in a beautiful oak letting in lots of sunshine. I knew I could take some risk with the choice of colors and I wanted to go bold. After scouting for some inspiration, I settled on a shade of tangerine. I know! 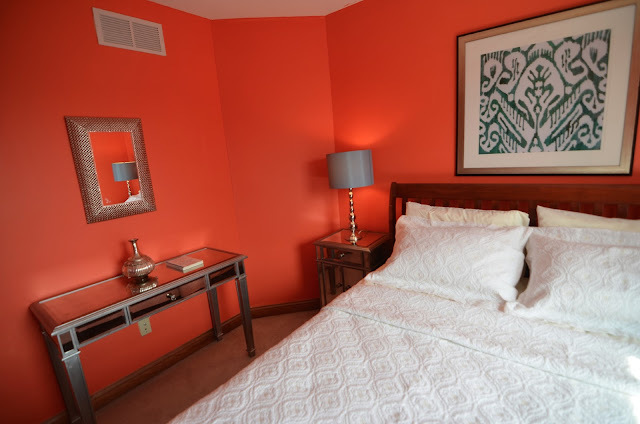 There was something about the earthy appeal of orange which I figured would help me create an inviting space for my guests. After a little negotiating with the better half (design debates -I call them!) I settled on a searing hue called autumn enchantment. After all, I wanted to create a space that would wow my guests! Who doesn't like a design challenge right? Mine was to work with a plain ole run-of- the- mill but perfectly functional sleigh bed that I have owned for years. I knew I didn't have wiggle room in my budget for a fancy new bed and so the old one stayed. I wasn't going to let that dampen my design dreams. Thankfully, I had given away the old nightstands just prior to our big move from Texas last year and that allowed me to look for new furniture! Mirrored furniture is all the rage and I had my heart set on them since they started trending. A pair of elegant mirrored nightstands was a perfect little addition to the bedside. I think they are so gorgeous they even give my poor bed a facelift ! Mixing in new with the old was a great idea in this room, don't you think? And since I love mirrored furniture so much, I even bought the matching vanity. The reflective surfaces work particularly well in a small space I think. 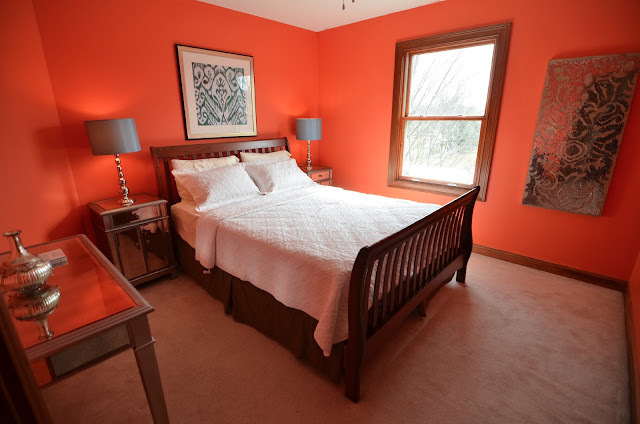 The all white bedding was a cognizant effort to temper down the fiery incandescence of the wall color. The texture made up for what the bedding lacked in color and overall it lends a cordial warmth despite being achromatic. Texture makes up for the lack of color! With the accessories, my core philosophy was "less is more". I wanted to steer clear of a cluttered space and that meant I had to edit the final touches with a keen eye. Budget was yet another limiting factor and so I narrowed it to a few necessary pieces. I found a pair of architecturally impressive lamps at Pier 1. The shiny ball stemmed lamps add stunning detail to the visual palette. I must add that I was not too fond of the shades but I figured it was neutral enough plus the price was great! As much as I appreciate global decor, I find it very hard to deviate entirely from Indian decor elements. I relate more to a space that in some way incorporates my ethnic roots. I brought in a little bit of India into this space via the Ikat art work, the Jali style mirror and the mosaic mirrored wall art. I fell in love with the mirror the minute I laid my eyes on it. The intricacy of the lattice frame reminds me of the Jali windows in the Mughal buildings around India and it perfectly accents the orange wall. 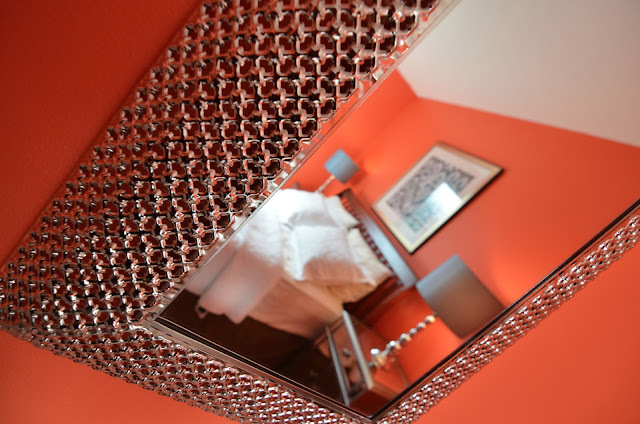 Every room needs a splurge and the mosaic mirrored wall art was just that. It was originally intended for another room in the house but it found its way to this room and I don't mind it at all! The scroll motif screams India and I love it! 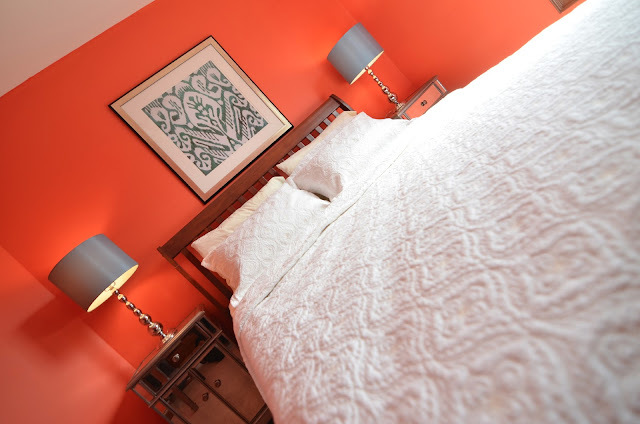 Lastly, the framed Ikat fabric above the bed is my favorite accessory in this room. Ikat is hot! Bold and eye-catching - this global motif is everywhere- dishes, pillows, wall paper, table mats, upholstery. In this room, I've used a small serving of this global design trend and yet it bestows big impact! The green in my framed Ikat fabric is a great accent color and pops against the white/orange backdrop. Ikat originates from Indonesian language and means "to tie" and it refers to a fabric weaving style where the threads are tied together and dyed before weaving the fabric according to Wiki. Several countries across the globe have their own versions of the fabric. Indian versions include Pochampally from Andhra Pradesh and Patola from Gujarat. Ikat designs are the product of painstaking craftsmanship and have quickly topped the charts in home decor trends. I love incorporating art forms into home decor and we've already showcased terracotta, warli, and kalamkari in our spotlight series. The Ikat print shares the spotlight on Aalayam today for its versatility and vibrant energy! While we are on the subject of bedrooms, I want to share this link to Roopa's bed room featured on Apartment Therapy. Previously, we had featured the rest of Roopa and Abhi's home on Aalayam. Remember their Zen Den and minimalist decor? 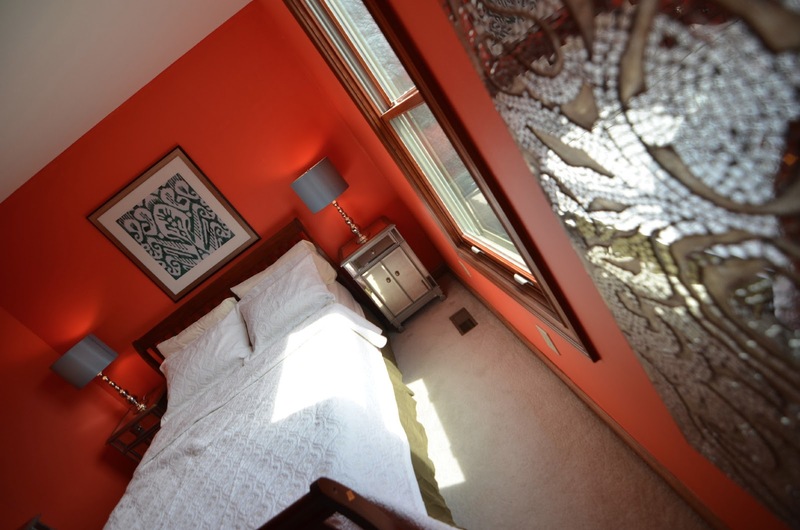 Today we get to see Roopa's zen bedroom which is selected as a finalist in the"My Bedroom retreat" contest! I would like to request Aalayam readers to please take a minute and cast a vote for her entry on Apartment therapy. Thanks for joining us and I would love to hear what you have to say about my guest room. And do you love Ikat prints as much as I do? Share your thoughts. p.s: All images are from my home and copyrighted. Please ask before using. It's gorgeous Deepa. Would love to see your bedroom. Lovely neat and clean bedroom....The bedsheet took my heart away. And loving the jali mirror....had been looking for something similar for my living room. The IKAT in green looks pretty and perfect with the orange backdrop. Loving everybit of it. Great going. Thank you. Means much coming from another design enthusiast! Yes, the textured white bedding is great- i bought it rather nervously, hope it won't be a maintenance nightmare. The jali style mirror was love at first sight and the Ikat was a serendipitous find :) now on to the next space in the house! Beautiful Deepa!! Loved the pearl white fabric...that texture! I really liked the lamps and the shades.The dull blue/green ties in well with the Ikat and adds to the fiery orange and soothing white palette. Whats next?! Div: Whats next? well- the blog has an interesting pipeline ahead- varied topics. Personally and time permitting, I will take on another space in the house - maybe the other guest room -we'll see. Thanks for your comments. I am glad that this space is receiving some good feedback! Radhika: Thanks for stopping by. I know! painting is a messy affair and I could't have handled the whole house at once...one room at a time is plenty ;) Would love to see your painted rooms. Care to do a home tour for our readers?? We would love to host you - email us if you would like me to showcase it. Oh yes! the suzani will get a post of its own :) watch this space! No problem! That is the joy of making a beautiful home - having friends and family over. Enjoy your beautiful home! This is one bold gorgeous room...beautiful.